Four has always been my favorite number. Forever and a day. Before I could count, I imagine that the visual of four always commanded me. Definitely before the number became sensationalized by Queen Bey. And, definitely before I understood it to be the number of completion. The simplicity and complexity of the number fueled me equally. So, it makes sense to me why the 4th principle is after my heart. Ujamaa. How can we pool our time, talent and resources together in an effort to provide a viable means of financial stability within our families and communities? Not just spending money, but spending money collectively across various mediums and needs with the intention to unapologetically grow ourselves. The upliftment of US through our spending. Kwanzaa defines it as Cooperative Economics. Independently bold words, but they are even bolder when viewed side by side. I am humbled to be the co-owner of the ARTisan Cafe, along with my partner Melody Joy Short. We created the ARTisan Cafe as a “taste of arts and culture” based in our hometown of Richmond, Virginia. As native Richmonders, we were both committed to diversifying the creative and arts platform in the area. The ARTisan Cafe is a retail cooperative space located at Stony Point Fashion Park. We feature local, regional and international artisans that are hard-working, creative, unique and progressive individuals who find value in building a diverse cooperative operation. While many view us as a store or gallery, in our essence we are a model of Ujamaa. 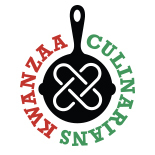 In keeping with the spirit of Kwanzaa Culinarians, I’m featuring a few of my favorite kitchen and culinary inspired pieces as well as the talented artisans that created them. Terina Nicole is the designer and founder of Jypsea Leather goods based in Newark, New Jersey. She desires to bring a sense of luxury and history to the products she creates by combining exotic skins with upcycled leather, fur or found objects. Check out these eclectic leather coasters. Soft, yet funky touches for the home. By Terina Nicole of Jypsea Leather Goods. The spikes give a fashion forward edginess rarely found in flatware. Make a statement when least expected! Check out these eclectic leather coasters. Soft, yet funky touches for the home. By Terina Nicole of Jypsea Leather Goods. Native Virginia Carren Clarke-McAdoo has been creating pottery for 14 years. Her work is inspired by her second love, culinary ate where she creatively combines function with flair and purpose. Her ceramics have intriguing details and always seem to tell a story. She has so much depth to her pieces. I’m a huge fan of her tea sets. This fun pedestal bowl brings inviting colors right to your table. Great for hosting during a dinner party and a nice conversational piece with guest. By Carren Clarke-McAdoo of Woodland Height Studios. Daffina is a family-owned company based in the Washington, DC metropolitan area. The line was founded in 2012 by a Sierra Leonean-American, Daffina, who has a love for fashion, and a keen eye for bold and vibrant African fabrics and textiles. The Daffina team personally hand-picks all fabrics to develop unique accessories, home goods and novelties. The wine bottle holders are great for sprucing up your home or to show a bit of personality when gifting loved ones with your favorite wine. The Daffina aprons add fun and flair to your cooking experience! Interested in purchasing or supporting more great talent? Connect with the ARTisan Cafe and our social media outlets via Facebook, Instagram, and Twitter. 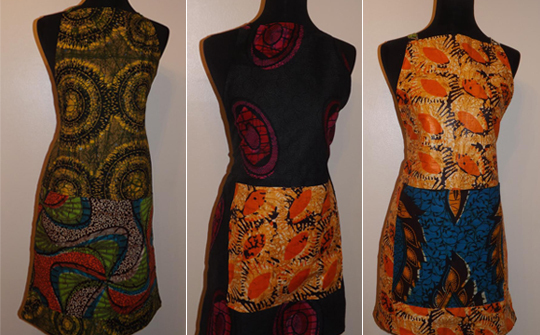 This entry was posted on December 15, 2014 by Kwanzaa Culinarians in 2014, business, shopping and tagged Adrienne Cole, African Print, African Wax Prints, Aprons, ARTisan Cafe, Carren Clarke-McAdoo, Daffina, fashion, Jypsea Leather Goods, leather, shopping, tea sets, Terina Nicole, Ujamaa, wine coasters, Woodland Height Studios.